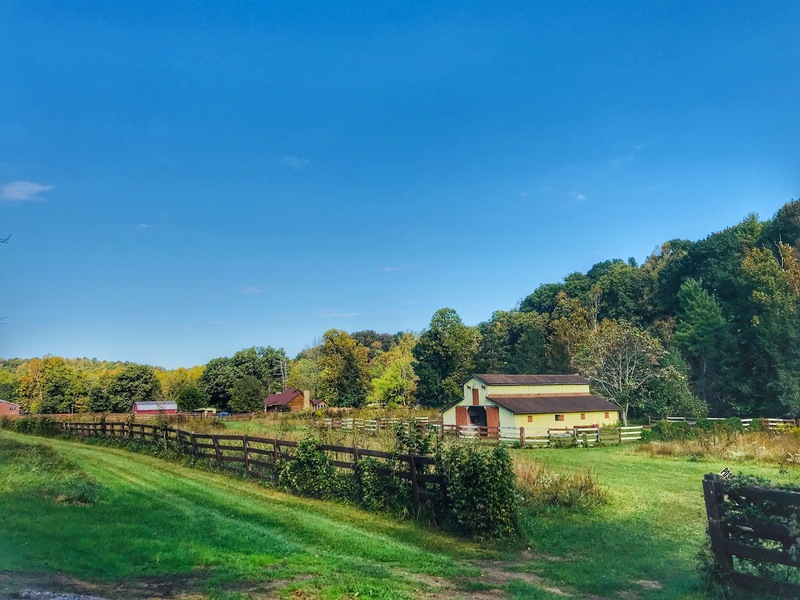 Typical views from the Virginal Creeper Trail. This was quite different from any other race weekend that had come before. For one, I had registered a long time ago, but then really had no intention of running this race after signing up for Fat Dog 120 in August and the adventure of a lifetime, the Everest Trail Race in Nepal, in November. I figured two huge events like that would be enough for this year and I could always do the Yeti 100 next year, since it was only a drive away from my home base. However, Wednesday I listened to the East Coast Trail & Ultra Podcast that had Jason Green on to talk about the race and it got me thinking. I hadn't done a race spontaneously ever. I also hadn't done a race solo without crew/pacer or any other support in a very long time. Did I still have it mentally to do 100 miles without anyone prodding me on? How about running two 100s just one month apart? By the time I got home from work, I sent Jason a message if I was still good to go and he said yes. Crap, was I really going to do this? 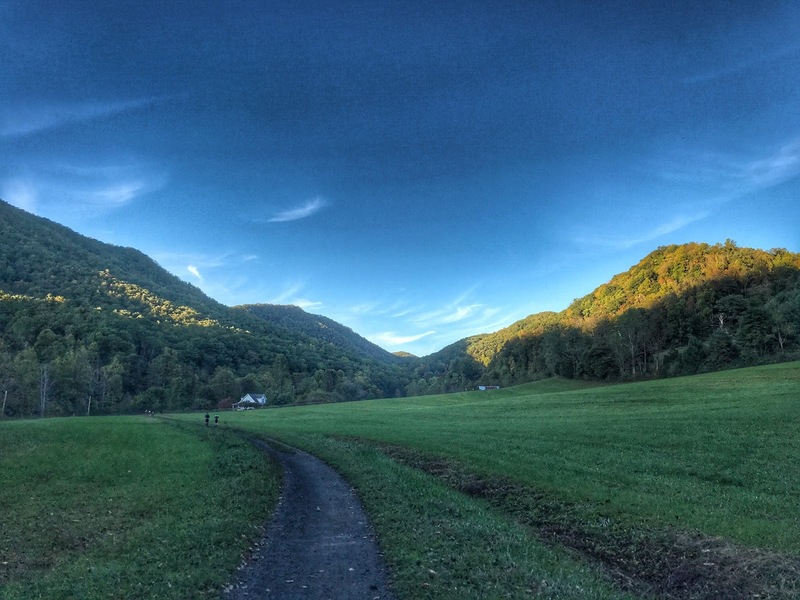 Run a 100 miler in two days? Probably not a good idea, but when did good stories ever come from well thought out plans, am I right? What followed was the fastest race prep ever. Open giant duffle bag, throw in race kit, spare shoes, a bunch of warm clothes, fuel, headlamp, etc., close duffle bag, done. I booked a room at Red Roof Inn, filled up my car and left Huntsville Thursday at noon. While I am usually a social media "overposter", I played this one close to the chest. I did not want any external pressure, perceived or otherwise. 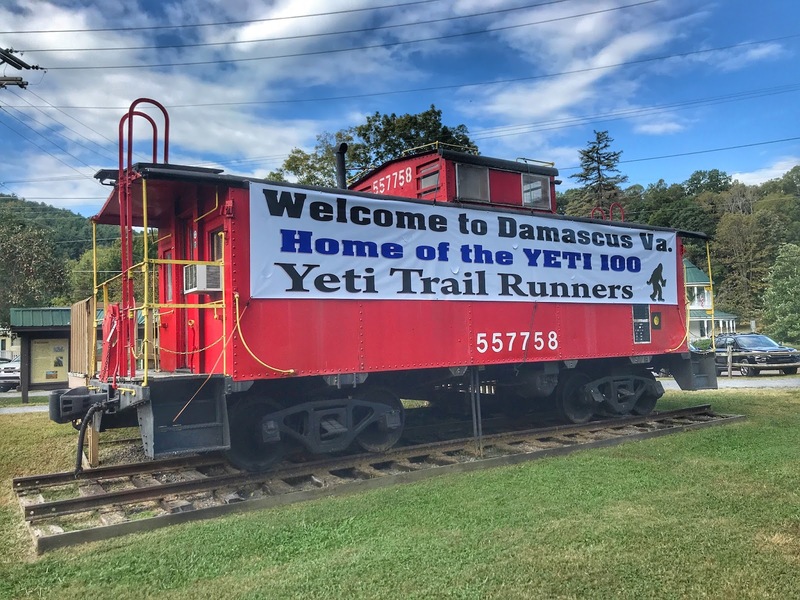 The town of Damascus fully embracing the Yeti 100 and its participants. I arrived in Damascus, VA a short 5 hours later, just in time to throw my one drop bag on the trailer outside the historic Rock School that was hosting the race packet pickup and pre-race briefing. Inside, there were about 250 "Yetis" ready to listen to RD Jason Green's final words of wisdom before continuing catching up with friends and heading to their respective accommodations. One of the 40+ trestle bridges on the course. I returned to the Red Roof Inn, finished laying out my race kit for the morning and sent Benj Lance a final text message about meeting in the morning, since he and his dad had kindly agreed to pick me up at the race finish and take me along to the race start, so I could leave my car for later. I still wasn't sure if I was ready, but that did not matter. Once Jason signaled the start of the race, all worries fell away and I just started chatting and running with Benj for a while. Benj and I had talked about goals for the day and since I really had no goals other than to finish in one piece and hopefully one day, I figured I'd try to stay with him for as long as possible. I've known Benj ever since I spotted him at a local ultra in a Barça jersey some years ago. I knew tight then and there that I would like this guy:-) We really hadn't had the chance to run together much over the years, so this worked out great. 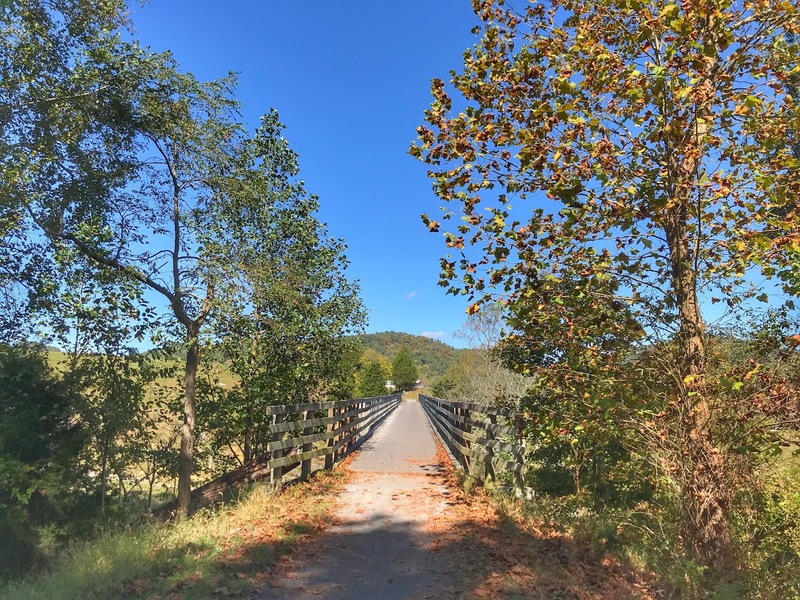 The race course starts at the east end of the Virginia Creeper Trail at the White Top depot at 3,500 feet elevation and runs approx. 33 miles west through Damascus (also the 50 mile finish line) and Alvarado (the lowest point on the course at 1,700 feet) all the way to the turnaround point and eventual finish line in Abingdon for a total elevation gain of around 3,000 feet and elevation loss of 6,000 feet. 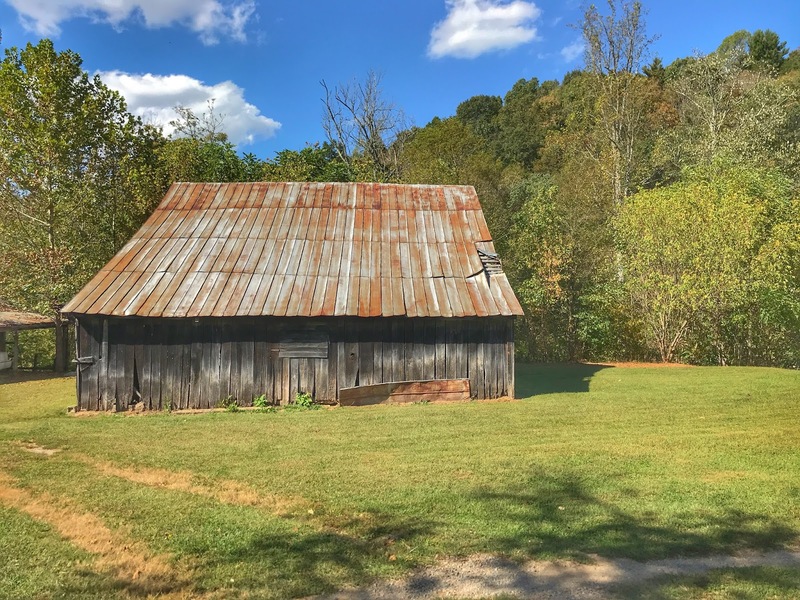 100 mile runners would run this course as an out & back & out, which made the second middle leg of the race course the toughest as runners made the 17 mile gradual climb back to the White Top depot turnaround point. Many of the trestle bridges feature unique structures. Benj and I both decided to start conservatively, even including occasional walk breaks on the initial 17 mile downhill stretch, just to try to save our legs for the later stages. 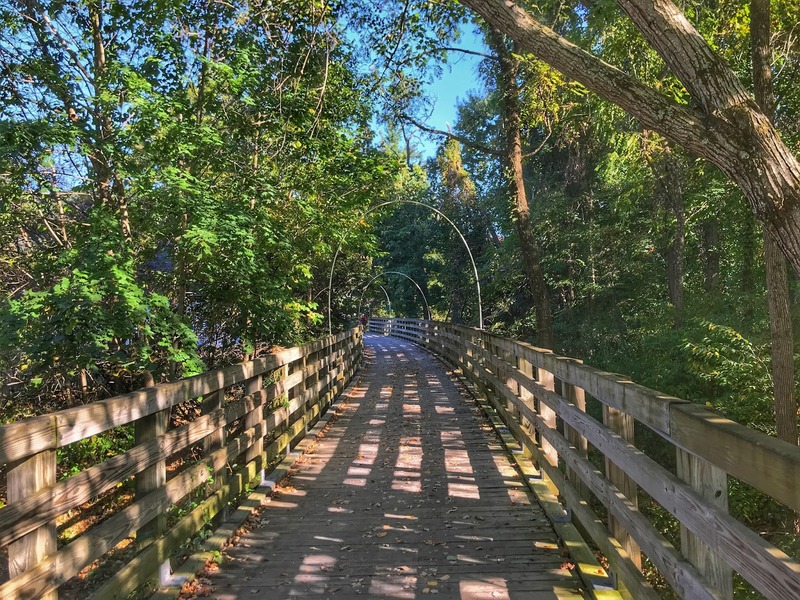 While this is a rails to trails path with mostly hard-packed dirt and gravel surface, the courses elevation profile invites or almost forces participants to run most if not all of the race...until they can no longer do so. The mostly even surface also meant that the same muscle groups and tendons would be doing most of the work during the race. This was not all all the type of training and racing I had been doing all year, quite the opposite. Most of my races this year have had serious elevation profiles and fairly technical terrain, so I was used to climbing a lot and descending a lot, which meant fast running, but also lots of "walk" breaks on the uphills. 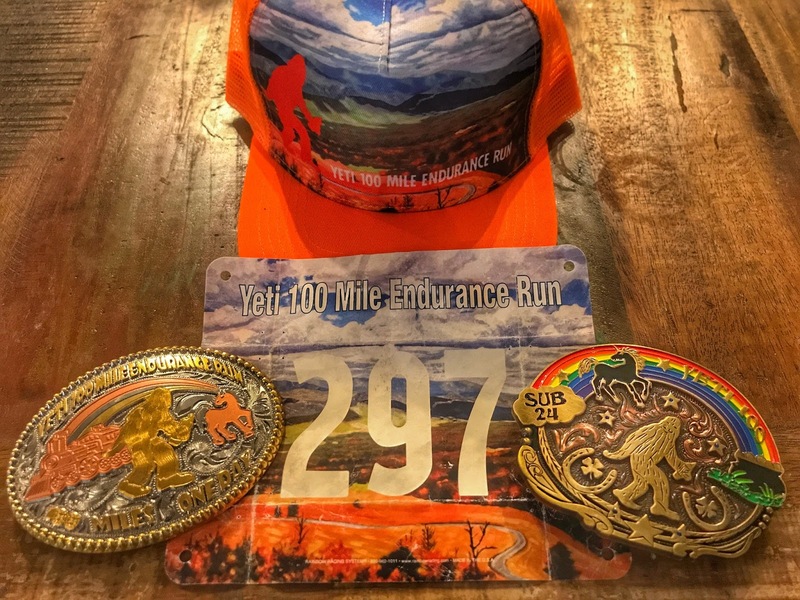 Not so at the Yeti 100 Mile Endurance Run. This race invites, asks and even lures runners to run until they can run no more. With a few exceptions, Olivier Leblond being one of them. A member of the USA 24 Hour National Team, Olivier was smiling all day as he crushed the 100 miles in 14 hours and 4 minutes, setting a new course record. Most others would eventually find out just how difficult it is to run 100 miles. I was one of those runners. Benj and I caught up on each others lives and adventures as the early miles ticked away quickly. We ran a very conservative pace, giving me no reason to worry. While this course was a lot flatter than most of my other recent ultra adventures, it was just as beautiful if not more so in many cases. 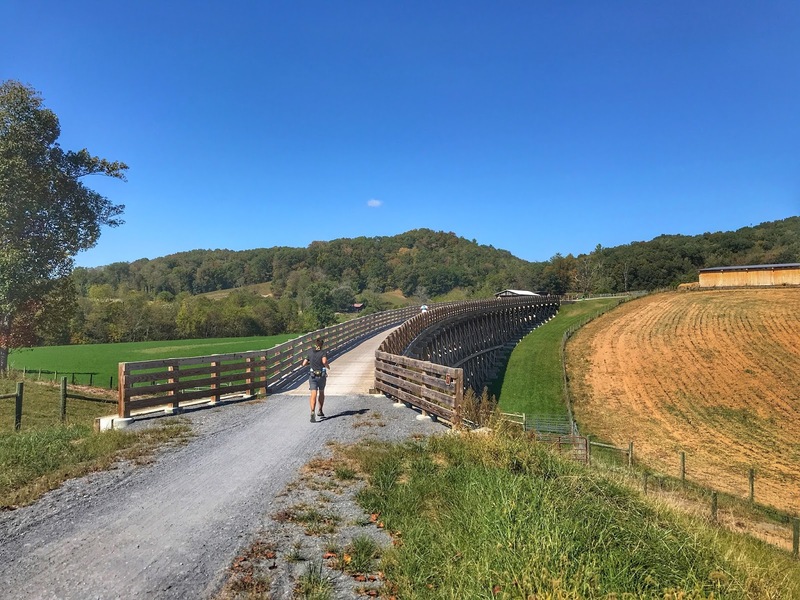 This rails to trail includes over 40 trestle bridges that runners would cross 3 times each. Most of the bridges had unique design features and were of varying lengths, mostly constructed of wood and some steel. The landscape was absolutely stunning. We rolled into the first aid station at mile 10, I refilled my bottles and we continued on. Somewhere along this section, Brett Addington, a fellow Huntsville runner, RCM pacer (more successful than me, but that is another story;-) and first time 100 miler, passed us. I never saw him again and he finished this race well under 24 hours, congrats again, Brett! Benj and I continued to keep our easy pace all while meeting new and old friends on the course. Before we knew it, we had arrived at the mile 17/50/84 aid station in Damascus for the first time. I located my drop bag, grabbed some more Honey Stingers and some Sword, downed a can of Coke and went on my way. During this next stretch, Benj's stomach started to give him trouble, nausea and pain, possibly related to a bug he dealt with the previous weekend that had landed him in the ER. I reminded him to take extra care to get enough electrolytes and nutrition since his body was already depleted from dealing with the bug earlier in the week. Unfortunately, we would not hit an aid station soon enough to allow him to address some of his issues. Instead, he needed to slow down to allow his stomach not to get worse. I stayed with him for a few miles before pushing ahead to stay on pace. I notified his dad at the next crew spot, so he would be ready to get him going again. I was sure he would catch up to me later on. I figured it was only a matter of time until my legs would get tired of running without significant walk breaks or downhill running. 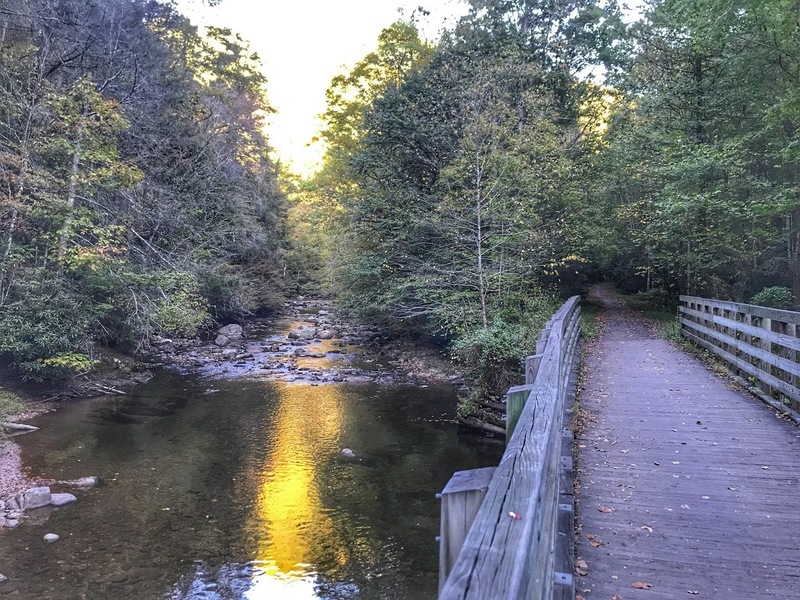 Much of the Virgina Creeper trail runs along Laurel Creek. I continued my pace strategy, actually running a little bit more now on the flats and the slight incline towards Abingdon, reaching the 33 mile turnaround point in just over 6 hours. 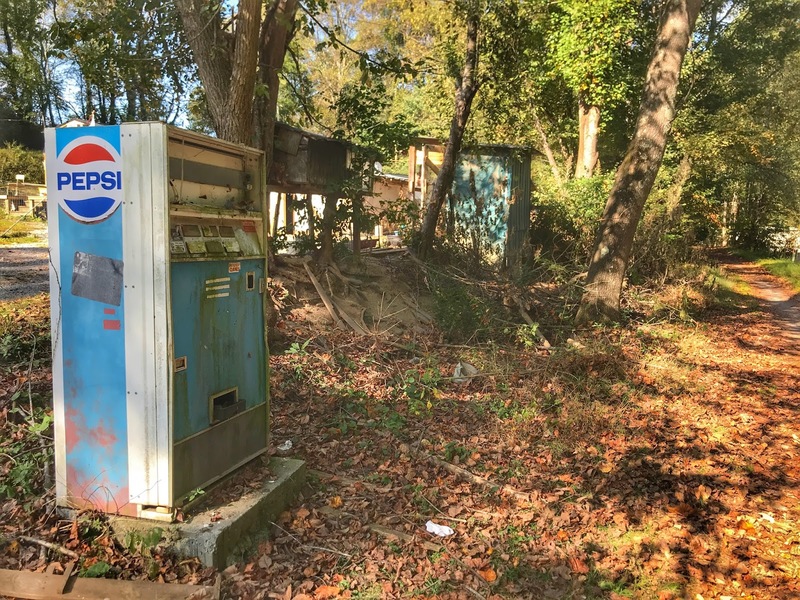 After a high five from Jason Green, RD extraordinaire, refilling my bottles and catching up with David Thurman and Russ Dixon, two fellow Huntsville area runners and both equally surprised to see me out there, I went on my way to get back to the White Top depot. I was mentally prepared for this section to be the toughest. However, I wasn't prepared for my stomach to go south on me as I rolled into the 50 mile AS in Damascus. 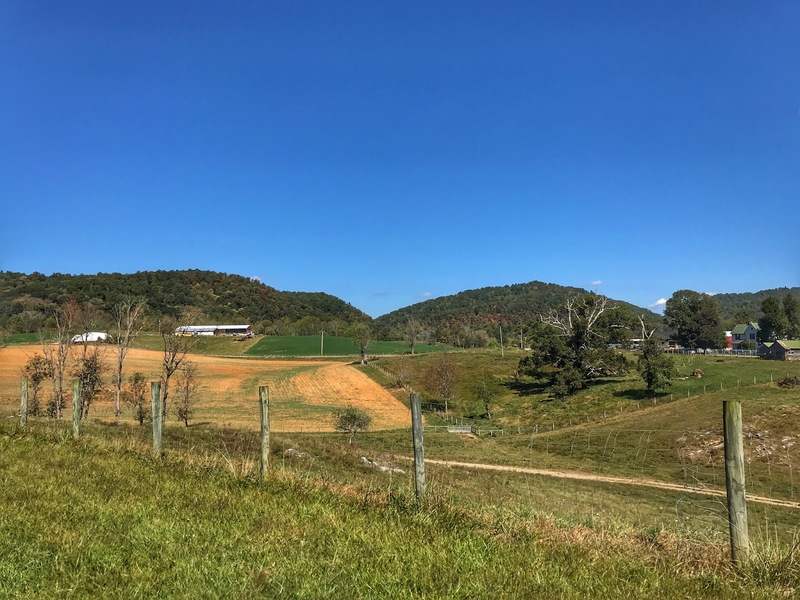 There were long flat stretches of the race course between mile 33-50 that were fully exposed to the sun and while the temps were only in the mid 70s, it was enough for me to get hot and for my stomach to start revolting. None of the foods looked appetizing to me, so I stuck to a cup and ginger ale and a cop of Coke. This and one single cup of ramen noodles along with my Sword drink mix would be the only calories my body would accept for the remainder of the race. There were constant reminders that this area does have some beautiful mountains. On a positive note, I stayed with the same pair of wool socks and Altra Timp for the entire 100 miles and did not develop a single blister. However, my pace continued to slow as the day turned into night. I was now running alone and continued to run alone for the next 30 miles. I was actually able to move uphill better than I thought, but the low levels of energy caught up to me and my pace continued to slow. Walk breaks became longer than I wanted them to be, but it became harder and harder to start running agin. It wouldn't be until mile 80 that I joined up with another runner after I took a pretty hard fall and he helped me "dust" myself off. Nick Schuster and I would stay together until the very end and while he says that I helped him get there, I can only return the compliment. Nights are even "darker" 80 miles into a 100 mile run and while it it nice to spend some time alone during an ultra to reflect, I am most definitely a social animal that enjoys the company of others, especially during the dark long hours of an ultra. Congrats again to Nick for completing his first 100 and for doing so in under 24 hours. Good luck at Pinhoti 100 next month. You are one cray cray dude, but I have confidence that you will do great there as well. Swag and awards done right. I came to this race to find out what Jason had created. I came here to get one of the most badass buckles awarded to 100 mile ultra finishers. I came here to see if I could still run an ultra solo without support crew and pacers and without the usual 6 month build up. I came here off the high of completing two very tough ultras in the previous 6 weeks, wanting to see if had what it takes mentally to finish another 100. I was able to accomplish all of these goals. However, while I may not have had crew/pacers along for the journey, fellow runners Benj and Nick as well as their crew Bob, Amanda, David and Russ were a definite help on my journey. Their support along with RD Jason Green and his entire crew of volunteers, cheerleaders, unicorns and yetis not only allowed me to succeed in getting that sub 24 hour buckle, but they made it a amazing journey and experience. Thanks everyone, hope to see you again on the trails, soon!